Ballina United hit nine goals against a hapless Iorras Aontaithe to take a giant leap towards claiming the 2018 Elverys Super League title last weekend. The North Mayo men now sit ten points ahead of Westport United with five games left to play and know that barring a serious collapse they will claim the title for the first time in five seasons. New signing Dylan Edwards took his league tally to nine goals as he hit four in the 9-0 win. Benny Lavelle also scored a hat-trick while Fabiano Macario and Jamie Cawley hit the other goals in an easy win for Mick Duffy’s side, which also leaves Iorras in serious relegation trouble at the foot of the table. Westport United moved ahead of Straide & Foxford United with an 8-0 win over Gary Byrne’s side on Saturday evening. It took John Russell’s side 28 minutes to break down the Straide & Foxford defence when Jack Murphy slotted home a penalty after he was upended in the box. After a long break for an injury to a Straide & Foxford player, Jesper Frisch doubled their lead a minute after the action resumed. Joe Lawless then made it 3-0 before half-time with a neat finish at the back post after Straide & Foxford failed to properly clear a corner. It was all Westport in the second half and Brandon Scahill scored their fourth after 50 minutes. Jesper Frisch then got his second after a mistake by the Straide & Foxford keeper and Adam Mulchrone made it six five minutes later. Mulchrone then got his second after some good work by Frisch & Scahill before he completed his hat-trick a few minutes later. Castlebar Celtic were beaten in Celtic Park for the first time in the league in over two years when Kiltimagh/Knock United shocked their hosts on Saturday evening. A brilliant performance from the East Mayo men moved them out of the relegation zone with a 4-2 win. Gavin Groarke hit a hat-trick for the winners. On Sunday morning Claremorris stayed in the hunt for second place with a 3-1 win over neighbours Ballyglass. The goals for Claremorris came from Danny Broderick, Simon Butler and Andrew Peters as they made it ten games unbeaten in all competitions. Manulla’s relegation worries were eased, while simultaneously plunging Ballyheane deeper into trouble, thanks to a 4-2 win in Carramore. An early Paul Lawless double gave Manulla an early lead before Ballyheane pulled one back through Cillian Redmond before the break. Damien Walsh then restored Manulla two goal cushion but it was far from a comfortable finish to the game as Redmond scored his second for Ballyheane only for Roger Clarke to seal the three points with the final goal of the game late on. 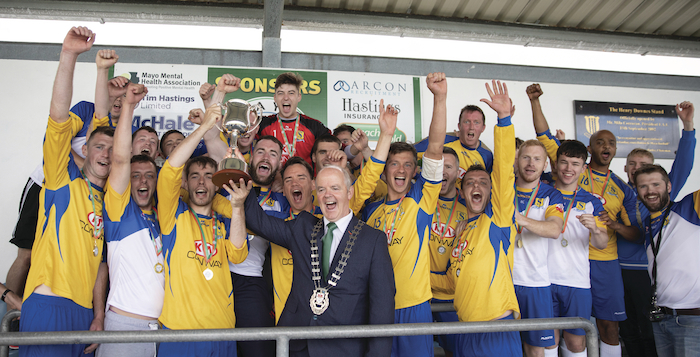 This weekend sees the introduction of the new Connaught Champions League Cup competition as Manulla and Westport United aim for provincial glory. Last season’s top two join the top two from each of the other provincial leagues in a new competition to be played out over the coming weeks. Connie Morrissey’s side will be hoping to continue their recent good run of form when they host Athenry on Sunday afternoon at 2pm. With the likes of Paul Lawless, Gary McHale and Chris Maughan in good form at the moment, and Athenry only being in pre-season mode, many will expect the home side to make home advantage count. Last season’s Super League winners, Westport United, are also in action on Sunday at 2pm as they host Ballinasloe Town. Similar to Athenry, the Roscommon & District League side are only entering their pre-season and will not be expected to be up to the same speed as their Mayo opponents. Last weekend’s 8-0 victory over Straide & Foxford will give Westport good confidence going into this game. The Tuohy Cup final was also decided last Sunday at Solar 21 Park in Milebush with Premier League leaders Snugboro United accounting for Swinford after extra-time. Snugboro had to play over 90 minutes with ten men after Austin Lacey was sent off for two bookable offences early on. In a first half that was low on clear cut chances the deadlock was finally broken on 41 minutes when Ronan McTigue headed home a freekick from Alan Lyons just as Swinford were trying to reorganise after losing David Brady to a nasty head injury. Swinford responded almost immediately as Paddy O’Donnell poked the ball home after his initial attempted pass was deflected back into his path on the edge of the six-yard box. Robert Ehlert secured the cup for Snugboro in extra-time, hitting the back of the net with just two minutes left on the clock.